By Mike Stines, Ph. B. Over the past 25 years or so there’s been a new sheriff in town when it comes to barbecue…pellet cookers. Pellet cookers use a power-driven auger to feed compressed wood pellets from a hopper into a burn pot that produces heat (and smoke) inside the cooking chamber. The auger is controlled by electronics that determine when more pellets and air flow are needed to hold the desired temperature. Unlike other smokers, pellet cookers will hold a set temperature without manual refueling as long as there are sufficient pellets in the feed hopper. Without pellets in the hopper, the auger will continue to run but the cooker won’t be producing any heat. Some units will sound an alarm if the pellet level in the hopper becomes too low, but most don’t—so they need to be occasionally monitored. Pellet grills are fueled by small wood pellets (think rabbit food about 1/4-inch in diameter) that are available in a variety of flavors. 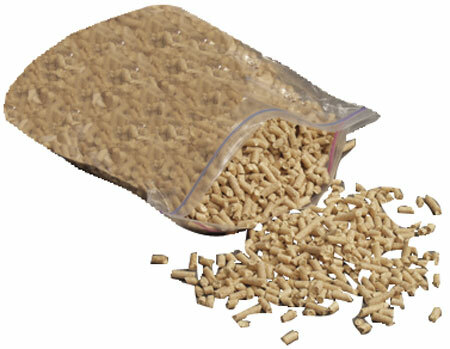 Pellet cookers need to use “food grade” pellets, not the less expensive (and more available) heating pellets that are made from a variety of wood that is often recycled scraps. Food grade pellets are 100 percent hardwood; they burn quickly – producing about 8,000 BTUs per hour – and have low ash residue. Pellet cookers first appeared in the late 1980’s when Joe Traeger developed and produced the first pellet grill. Traeger continues to make a variety of pellet cookers today (and is one of the largest pellet grill manufacturers) with prices starting around $400 to over a thousand dollars depending on size and features. Since the initial introduction, numerous other manufacturers have come – and gone – from the pellet cooking world. In terms of convenience, pellet grills come close to gas-fired grills… turn the cooker on and give it ten to 15 minutes to preheat. You’re ready to cook in a short time but with the benefit of having smoke flavor that you can’t get from a gas-fired grill without adding pellets or wood chips. • One is the cost and availability of fuel. The grill runs on pellets that cost between fifty cents to $1 per pound depending on the vendor and the flavor of the pellets. Most pellet grills burn between two to four pounds per hour depending on temperature setting, ambient temperature and wind. • Some manufacturers require that you use their pellets to maintain the warranty (I don’t know how they would know if you don’t). Here in southeastern Massachusetts there is no one selling cooking pellets, so they have to be ordered. Shipping costs will vary, so that needs to be added to the equation. • Another factor is the actual construction of the cooker. Lower cost pellet grills with thin walls will burn more pellets than thick-walled or double-wall grills. (Some manufacturers offer insulating covers. • You’ll also need a 120-volt GFI-protected power source to make the grill run. • If you’re used to a heavy smoke flavor from a stick burner or ceramic grill you won’t find that from most pellet cookers. They impart a mild smoke flavor at lower temperature settings (175 to 275 degrees F.) and almost no smoke flavor at higher (grilling) temperatures. In addition to a wide variety of stick burners, charcoal cookers and competition-grade cookers, Yoder Smokers offer three pellet grills: the YS480 at $1,099; the YS640 at $1,299; and the top of the line YS1320 for $3,395 (prices are without optional accessories). The YS480 has a 480 square inch cooking area and a 20-pound capacity in the pellet hopper. With an optional second shelf the cooking area is increased to 800 square inches. Front and side shelves made of 7/16-inch hard chrome round bar steel are standard. The cooker features a digital controller that offers temperature control in five-degree increments from 175 to 600 degrees F. It weighs 180 pounds. I have a Yoder YS640 that I’ve been using for a few months. It’s a great cooker that will smoke, grill and work like a conventional oven. One feature I like about the YS640 is the “variable displacement damper” that allows the cook to actually control how much heat is distributed across the grill. With the damper all the way toward the fire pot, concentrated heat allows for high-temperature grilling (with or without the optional $89.95 custom-made Grill Grate “Direct Grilling” accessory); with the damper all the way open the grill has an even temperature across the cooking grate, allowing for low and slow cooking. Another feature unique to the YS640 that sets it apart from a lot of pellet grills is its sheer mass. The grill is a tank weighing in at 325 pounds (with the optional second shelf, the weight is about 340 pounds). This is not a grill you’ll be wheeling around the yard—but on the up-side, the weight of the grill and its 10-gage steel construction has better heat retention than thin-walled cookers. The YS640 main cooking shelf is large enough to hold a full hotel pan with its 640 square inch cooking area. Adding the second shelf increases the cooking area to 1,070 square inches. Yoder offers a 10-year warranty on the grill; a three year warranty on the control system and a one-year warranty on the igniter. The grills are U.S. made. Traeger pioneered pellet cooking and probably has the largest distribution of all pellet cookers. Originally, the grills were manufactured in the U.S. but since late 2008 they have been produced in China—reducing the cost (and some say quality) of the grill. The “Junior” with a 292 square inch cooking surface and a three speed controller (a thermostatic control is optional). Costing $399, the Junior has a 19,500 BTU burner and weighs 68 pounds. The “Lil’ Tex” is another cooker without any thermostatic control. The 20,000 BTU burner has three settings: smoke (200 to 225 degrees F.); medium (325 degrees F.); and high (450 degrees F.). It has a 418 square inch cooking surface and weighs 125 pounds. The unit sells for $699. (The “Lil’ Tex Elite offers thermostatic control and other upgrades for an additional $100). The “Texas Grill” cooker uses a digital controller and a 36,000 BTU burner. The cooking area is 646 square inches. It weighs 165 pounds and costs $999. The “Traeger XL” has an 836 square inch cooking area utilizing two shelves. The XL has an adjustable thermostat with an LED display controlling a 72,000 BTU burner. It weighs 324 pounds. The Traeger “Select” is an upgraded model based on the discontinued “Deluxe.” It features an 18-pound pellet hopper to feed a thermostatically controller 36,000 BTU burner. It has a 590 square inch cooking surface and weighs 191 pounds. The top-of-the-line model costs $1,299. Traeger grills are covered by a three-year warranty. Based in Reno, NV, Green Mountain Grills offers two backyard pellet cookers and a competition model. While designed and engineered in the U.S., the grills are manufactured in China. The “Daniel Boone” has a digital control for regulating temperature from 150 to 500 degrees F., a meat probe, and a peaked lid for “beer can” chicken and other larger cuts of meat. Other features include a positive pressure hopper fan to prevent burn-back, and a 432 square inch cooking surface and a convenience tray with utensil hooks. It weighs 152 pounds and costs $759. The “Jim Bowie” comes with the same digital control, a meat probe, a peaked lid and a convenience tray with utensil hooks. The stainless steel grate measures 600 square inches. It weighs 183 pounds and costs $1,199. The meat probe doesn’t regulate the cooker but allows the cook to monitor meat temperature without opening the lid or using accessory thermometers such as the iGrill or Maverick. Ports for the meat probe are standard. The convenience tray (side shelf) is also standard. Options include a front shelf, thermal blanket, vinyl cover, upper rack to increase cooking area, and a remote controller allowing monitoring and control of the grill from up to 100 feet away. Both grills can be equipped with a stainless steel top on the cooking chamber. Based in Oregon, Mak Grill smokers are made in the U.S. and offer four pellet cookers beginning with the “One Star General” up to the limited production “Four Star General” stainless cooker. The “One Star” has a 380-square inch cooking surface (expandable to 760 square inches) and a digital controller. It also has a remote controller option ($399) allowing the grill to be adjusted and monitored from 300 feet away. Made of 16-gage stainless steel, the cooker weighs 145 pounds and costs $1,399 without options and accessories. The company considers its “Two Star General” as its “flagship” and most popular model. Features of the Two Star include a pellet hopper dump door allowing for quick changing of flavored pellets, a stainless steel removable fire pot, and an ash clean out door. It has a 429 square inch cooking surface (858 inches with the second shelf) and a temperature range of 170 to 500 degrees F.
A nice feature of the Two Star is a 220 square inch warming box on the right side of the grill allowing for cold smoking or holding of cooked food. The outside of the warming box is equipped with four utensil hooks. The cooker weighs 200 pounds. It cost $2,399. Manufactured by Hearthland Products in Minnesota, these pellet grills are U.S. made. The company also manufactures pellet heaters. It offers four pellet cookers. The “Memphis Elite” has double-wall 304 stainless steel construction with a temperature range of 180 to 700 degrees F. The dual hopper holds 24 pounds of pellets and feeds a dual auger system. The grill is equipped with 5/16-inch stainless steel cooking grates and has an 844 square inch cooking surface (expandable to 1,252 square inches). The cart model weighs 283 pounds and costs $4,149. It is also available as a built-in model for outdoor kitchens. The “Pro” model, also available as a built-in or cart model using either 304 or 430 stainless steel has an 18-pound hopper (two nine-pound hoppers) and a 562-inch cooking surface that is expandable to 834 square inches. The cooking grates are 0.312 inch stainless steel rods. The cost is $2,599. The “Advantage” model has a 970 square inch cooking area and uses 0.312 inch stainless steel rods for the grates. Constructed of 430 stainless steel, the cooker is double-walled with a single auger feed system. The hopper holds 12 pounds of pellets. The cart model weighs 186 pounds. The “Select” model is single-wall construction with a 427 square inch cooking area (expandable to 699 square inches). Constructed from 430 stainless steel, the cooker weighs 130 pounds and has a 12-pound pellet capacity. The cooking grates are .250 inch nickel plated rods. Its price is $1,399. The Rec Tec cooker has a 40-pound hopper capacity—one of the largest available—and is electronically controlled from 200 to 500 degrees F. in five-degree increments using a proprietary PID (proportional-integral-derivative) algorithm. The grill is made in China and weighs 203 pounds. The grill has a 680 square inch cooking area and uses 1/4-inch stainless steel round rods for the cooking grates. Its interior is tall enough for “beer can” chicken or a whole turkey. A unique feature is an interior light in the cooking chamber. It also features four tool hooks, a stainless steel towel ring, side shelf and a cover as standard. The grill has two fixed wheels and two locking casters. Rec Tec uses 304 stainless steel for many of the cooker components including nuts, bolts, grates, fire pot, flame deflector, drip pan and handles. The Rec Tec requires assembly but is covered by a six-year factory warranty. The company also offers a 30-day return policy if you don’t like the grill. They’ll even pay for the return shipping! The MSRP is $1,598 but the unit has been advertised on the web site for $998. Ed “Fast Eddy” Maurin, a Kansas City firefighter, developed his line of pellet cookers in the late 1990’s and later sold the operation to Cookshack in 2004. Cookshack is based in Ponca City, OK and the grills are U.S. made. Heat is provided by an electronically controlled burner fed from an external pellet hopper. With the optional temperature probe you can put your meat in the smoker, set the desired target temperature and the FEC will control the heat. Once the target temperature for the meat is reached, the smoker temperature will drop into a hold mode. Although the temperature probe is an option, it’s definitely recommended. Cookshack offers two models for backyard cooks: the PG500 and the PG1000. Both models feature a 36,000 BTU burner. The “PG500″ ($1,595) has a total cooking area of 784 square inches: 180 square inches for direct cooking; 324 square inches for indirect cooking and 280 square inches on the top rack. The cooker holds 22 pounds of pellets and Cookshack estimates pellet usage at 2.1 pounds per hour at 400 degrees F. The PG500 is constructed of stainless steel but is not insulated. The grill has a few nice options: a pellet ash tray and a warming drawer below the firebox. It also has a sliding opening in the right side of the cooking chamber for meat probes or thermometers. The grill is equipped with a cast iron cooking grate on the direct side of the grill and nickel plated grates for the indirect side of the grill and the top rack. An optional front shelf and front caster kit are available. The “PG1000” ($2,790) has the same cooking area as the PG500 but features a double-wall insulated hood for better heat retention and reduced fuel use. The hopper holds 25 pounds of pellets. 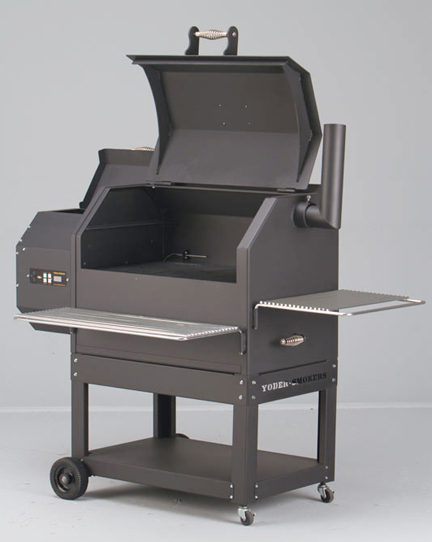 The grill comes with four casters, a lower storage shelf, warming drawer and side shelf as standard equipment. The side shelf holds a three-inch flue for effective smoking. Cookshack offers a 30-day money back guarantee and a two-year limited warranty on the smokers. Pellet grills are constantly evolving, with upgraded software and technology for the controllers and different designs for the actual cooker. Improvements are also being made on the auger delivery system and igniters. A quick Internet search will let you learn about new manufacturers and new equipment. And there are a few Internet sites that can give you more information: Let’s Talk BBQ, pelletsmoking.com and pelletheads.com.